As of yesterday, North America is out of IPv4 addresses. Getting that feeling of déjà vu all over again? In July, we reported that ARIN, the American Registry for Internet Numbers, was activating its waitlist policy, wherein organizations that qualify for a block of IPv4 addresses larger than the largest block in ARIN’s available pool of addresses could opt to wait for that larger block to become available. Organizations requesting block sizes that were still available would still receive IPv4 addresses. But as of September 24, ARIN no longer has any IPv4 addresses available to be given out to organizations in the region. The pool is empty. This time, it’s for real. So organizations in the US, Canada, part of the Caribbean, and some additional islands will either have to take their chances on the waitlist, buy IPv4 addresses from someone else, or use IPv6 instead. In an earlier interview, ARIN CEO John Curran told Ars that he expects very little new IPv4 address space to become available at ARIN, so those on the waitlist shouldn’t get their hopes up. Address trading, on the other hand, has been picking up in recent years and is now the best way to get additional IPv4 addresses. Because ARIN no longer holds any IPv4 addresses, “there is no longer a restriction on how often organizations may request transfers to specified recipients,” explained the ARIN announcement. Previously, an organization couldn’t get any new addresses from ARIN within twelve months after transferring some of its IPv4 addresses to another organization. Address trading works well for relatively small blocks of address space, but it’s unclear what will happen when very large ISPs that deal with millions of IP addresses need additional large blocks. Will they be ready to pay potentially tens of millions of dollars for millions of IPv4 addresses? Will such large blocks even be available, or will they have to make lots of small purchases? In the meantime, 99.967 percent of the (much larger) IPv6 address space is still available. Of course the trouble is that both sides of a client/server connection need to have IPv6 before communication over the new version of the Internet Protocol is possible. For a long time, very few users and very few servers were IPv6-enabled, but that has been changing quickly as of late, especially on the consumer side, as measurements by Google show. Enlarge / Global IPv6 adoption as measured by Google. During weekdays, seven percent of Google’s world-wide visitors are IPv6-capable. But over the weekend, this increases to nearly nine percent (apparently, more people have IPv6 at home than at work). These numbers are almost double what they were a year ago. The US in particular seems to be picking up the new protocol quickly, with 21.3 percent IPv6 users in Google’s measurements. Only Belgium and Switzerland do better, at 35.9 and 22.6 percent, respectively. 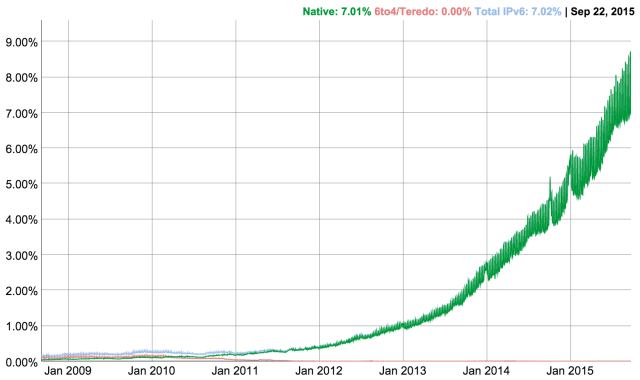 The Web, on the other hand, has been mostly resting on its laurels since World IPv6 Launch back in 2012. Since then, some countries have seen the percentage of their Alexa top 500 sites supporting IPv6 actually decrease. However, both the global top 500 (heavily populated by the likes of Google and Facebook) and the US top 500 have seen an increase in IPv6 support in 2015, with the current level being at 25 and 14 percent, respectively. Ars has no timetable for a switch to IPv6 in the near future, but it’s almost certainly inevitable at some point!